Sometimes the easiest way to teach kids is to trick them into thinking they’re not learning. An effective way of doing this is finding out what kids are already interested in and using that interest to fuel teaching methods, so if you have grade school students that love superhero movies, superhero comic books are a good choice of materials to get them started on reading. I’ve mentioned before that a teacher friend of mine used Adventure Time episodes to get his junior high students to examine works critically, and some kids that had been previously struggling with single sentences were able to put entire paragraphs together when the work involved engaging with something they enjoyed outside of an educational context. 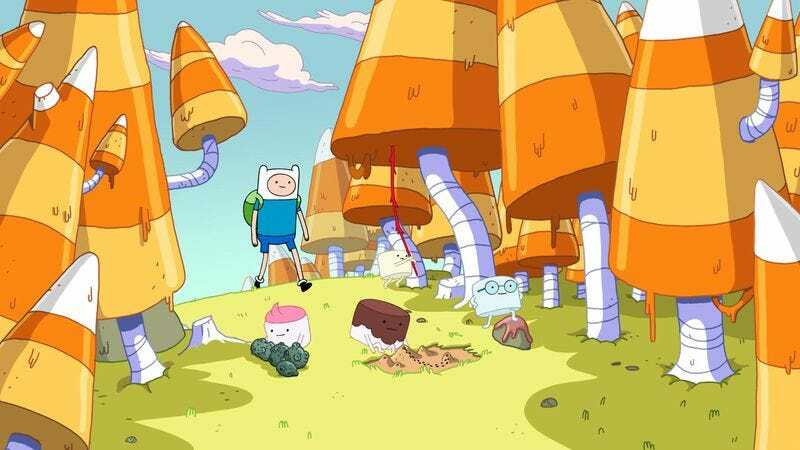 Finding a way to guide kids to knowledge is the major idea behind “Scamps,” which has Finn taking the Marshmallow Kids on a nature walk in hopes of directing them away from the grifter lifestyle. The kids have been raking in $500 a day scamming citizens of the Candy Kingdom with their clam shell grift, but Finn thinks he can change their ways by exposing them to all the things they’re denied in their urban environment. Writers/storyboard artists Kent Osborne and Somvilay Xayaphone mine a lot of humor from the naïve ignorance of the children, who have no concept of natural things like trees and rivers and are amazed when they discover them with Finn’s help. The sequence where Finn and Jake corner the Marshmallow Kids does a great job accelerating the momentum of the episode with style and humor. The jazzy music and dynamic angles and editing give Finn’s foot chase a big burst of energy, and there’s some very sharp comic timing in the final moment when Jake turns into a wall that blocks the gang in. The rest of the episode isn’t as thrilling as this sequence, switching into a calmer mode as Finn and the gang commune with nature. There are some very nice landscape visuals, though, particularly the extreme long shots showing the sprawl of the candy corn forest that serves as Finn and the kids’ campground. Finn tries to expose the kids to the majesty of the natural world, but they’re still focused on grifting, making the forest creatures their new marks and hustling quite a pile of nuts in the process. 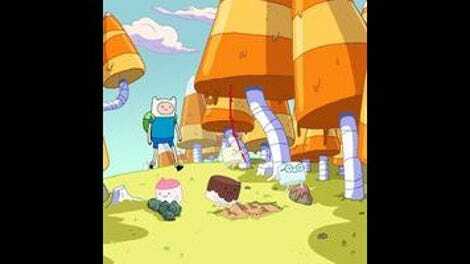 When Princess Bubblegum calls to check in on Finn’s progress, Finn lies and tell her that everything is going well, and his willingness to deceive the highest authority in the Candy Kingdom gains him the respect of the Marshmallow Kids, who are now eager to learn from Finn the grifter. That’s when Finn realizes that he needs to change his teaching strategy, so he frames his camping lesson as one big scam, using grifter language to trick the kids into thinking they’re pulling a long con on nature. Finn starts with one of the camping basics: building a campfire. He tells the kids to start by scamming some dim-witted sticks lying around and tricking them into a bundle. Then you rub two of the marks (sticks) together, defraud (rub) them together, flim-flam (blow) your breath onto them, and bamboozle (set) the flaming idiot sticks on the other marks so they catch on fire like a bunch of suckers. From there, they build shelter by finding some branch rubes, misleading the longest branch so it lays between two blockhead trees, then double-crossing boughs to lean against each other. It’s a very silly sequence, but it’s effective at showing how changing a teaching approach can draw students deeper into the lesson. Finn’s strategy is basically to change the camping verbs into grifting verbs and then add some insulting adjectives to the mix, and the kids react very positively to it. The kids find delight in being able to sneak up on a bush and steal its berries, and framing this basic camping act as something criminal appeals to the kids’ impulse to break the rules. Unfortunately, Finn’s teaching strategy poses problems when he’s drowning in caramel quicksand and the kids decide to scam a vine into becoming a rope by doing their clam shell grift rather than just yanking the vine down. Finn put all his teaching in the context of a scam, so when the kids have to apply his lessons, they turn to the best scam they know. When that doesn’t work, they resort to violence and just hit the vine, which actually does the job and sends the vine into the quicksand to save Finn. The kids still have a lot to learn, but Finn’s nature walk pushes them in a direction where they want to learn, taking them off the streets and into a classroom where they gleefully study reading, mathematics, and geography. While there are clear financial benefits to their grifting, the Marshmallow Kids turn to crime because they don’t know of any other ways to pass the time. And that’s a big part of education: it expands your knowledge, which makes it possible for you to engage with things around you on a deeper level. I don’t know if things have changed in elementary and high schools, but when I was younger, the smart kids usually weren’t the ones that acted up in class. I was one of those rare honors students that ended up in detention a lot for bad behavior (I had a big problem with talking to friends in class), and I almost never saw my fellow honors students during those hours spent after school. By giving these kids an education, Finn shows them that there’s a healthier, more fulfilling way of living their lives, and the kids’ aggressive and deceptive impulses have been replaced by an excitement to learn by the end of the episode. The Marshmallow Kids lighting themselves on fire is a pretty great intimidation tactic. And the ash just falls right off! PB is really amping up her style game at the end of this episode. She’s got her hair feathered to the heavens, and she’s rocking high-waisted white shorts with a puffy purple top, teal scarf, and pink boots. It’s a look that would be very easy to cosplay, which I think is probably the point.